Reference number for this case: 18-oct-54-Gelles2. Thank you for including this reference number in any correspondence with me regarding this case. 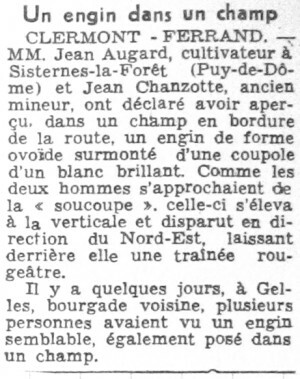 An article in the regional newspaper Le Méridional dated October 20, 1954, said that days earlier, in Gelles, several people had seen an ovoid "machine" posed in a field. Aimé Michel cite this in his 1958 book without citing any source, then Jacques Vallée notes in 1966, still without citing any source, that this observation was that of a "cigar-shaped luminous 'machine' that crosses the sky at quite fast pace and noiselessly", wondering whether it should be "exclude 'immediately' as a meteor?" and commenting that he cannot answer. To make matters more complicated, there was on that day near Gelles - in Gelles for some - the alleged sighting by Mr. Bachelard. Aimé Michel reports in his book that on October 18, 1954 in Gelles, according to the assertion of several people, a machine of ovoid shape, and smaller than those seen elsewhere this day, landed in a field. The magazine mentions that in addition to the several other observations this day at this place, several people have reported having seen a smaller, ovoid craft landed in a field. The magazine quotes Aimé Michel as source. The two authors indicate that in Gelles in the department of the Puy-de-Dôme, on October 18, 1954 at an unspecified time, several inhabitants observed an oval shaped object of small size on the ground. The authors indicate that the source is Aimé Michel in "A Propos des S.V." page 241. The Belgian ufologist indicates that in 1954, on October 18, in France, in Gelles, "Several inhabitants - small ovoid object posed on the ground." The source is indicated as "FIGUET/ J.L. RUCHON: 'Ovni, premier dossier complet...' - Alain Lefeuvre pub. 1979, p. 184". Luc Chastan indicates that in the Puy de Dômes [Puy-de-Dôme] in Gelles on October 18, 1954 at an unknown hour, "Several inhabitants of Gelles observe an ovoid object of small size posed on the ground." The website indicates that on 18 October 1954 in Gelles, France, "Several people asserted that they had seen an ovoid object, smaller than one seen by Bachelard, resting in a field. An object was observed. Electromagnetic and physiological effects were noted. One ovoid object was observed by several witnesses in a field." [fr1] "OVNI, Premier Dossier Complet des Rencontres Rapprochées en France", book by Michel Figuet and Jean Louis Ruchon, Alain Lefeuvre publisher, France, page 184, 1979. 1.0 Patrick Gross June 6, 2009 Conversion from HTML to XHTML Strict. First formal version. Additions [go1], [lc1], [ud1]. 1.1 Patrick Gross February 10, 2010 Addition [lc2]. 1.3 Patrick Gross October 12, 2016 Addition [lm1]. 1.4 Patrick Gross January 19, 2019 Additions [mf1], Summary. Explanations changed, were "Not looked for yet. ".